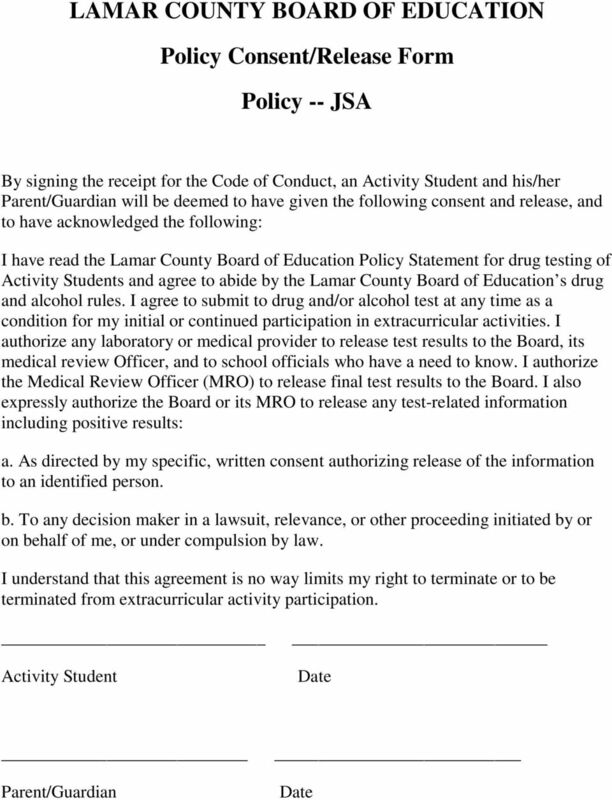 Download "Lamar County Board of Education Drug and Alcohol Program Procedures JSA. II. Drug use/distribution/impairment/possession"
1 Lamar County Board of Education Drug and Alcohol Program Procedures JSA I. General Policy Practical experience and research has proven that even small quantities of narcotics, abused prescription drugs or alcohol can impair judgment and reflexes which can create unsafe conditions for students. Even when not readily apparent, this impairment can have serious results for students. Drug-using students are a threat to other students and themselves, and may make injurious errors. 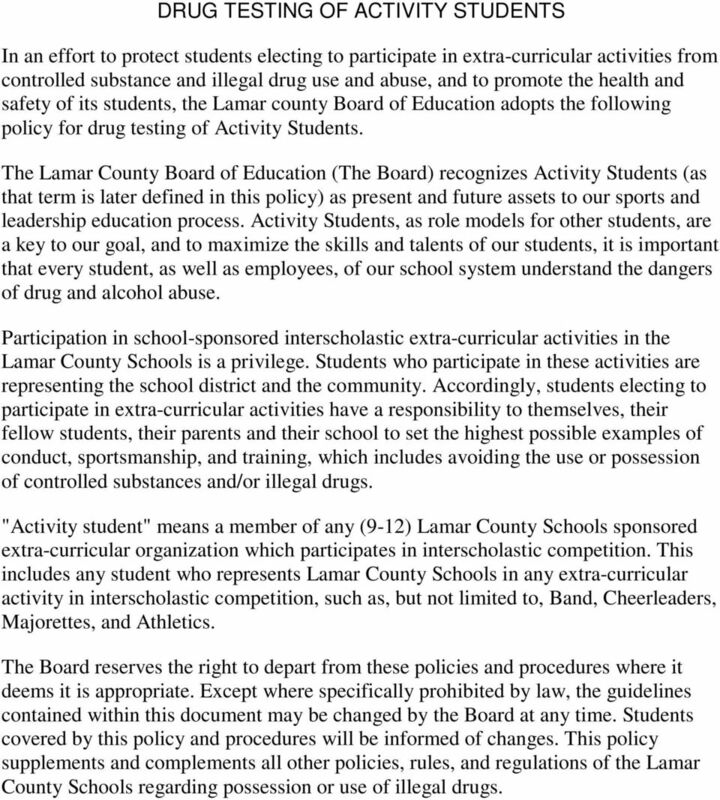 For these reasons, the Lamar County Board of Education (the Board) has adopted a policy that all Activity Students must report to all practice and competitive events or any extracurricular activity while under the care of this school system completely free from the effects of alcohol and/or the presence of drugs, unless used as prescribed by a physician. II. Drug use/distribution/impairment/possession All Activity Students are prohibited from using, possessing, distributing, manufacturing, or having controlled substances, abused prescription drugs or any other mind altering or intoxicating substances present in their system while at practice or participating in competitive events or while under the care of this school system. III. Alcohol Use/Possession/Impairment All Activity Students are prohibited from possessing, drinking or being impaired or intoxicated by alcohol while at practice or participating in a competitive event or while under the care of this school system. IV. After School Hours Conduct After school hours use of drugs, alcohol or any other substance is prohibited. Activity Students should realize that these regulations prohibit all illicit drug and alcohol useduring and away from school activities. 3 before the results of the test are released, whichever is earlier. While one coach, assistant coach, faculty sponsor or school official may request a reasonable cause test, when feasible, he or she is encouraged to obtain a second adult s opinion as a witness. 2. Random Testing The Board will conduct random unannounced screening of Activity Students. The drug testing agency will provide computerized random sample lists to the Drug Program coordinator. The list of Activity Students in the random pool will be updated periodically. Activity Students will be required to report to the Board-designated collection site for testing as soon as possible but in no case later than 4 hours following notification. 3. Return to Participating Testing All Activity Students referred through administrative channels who undergo a counseling or rehabilitation program or who are suspended for abuse of substances covered under this policy will be subject to unannounced testing following return to an extracurricular activity for no less than 12 months and no more than 60 months. C. Testing Procedures 1. 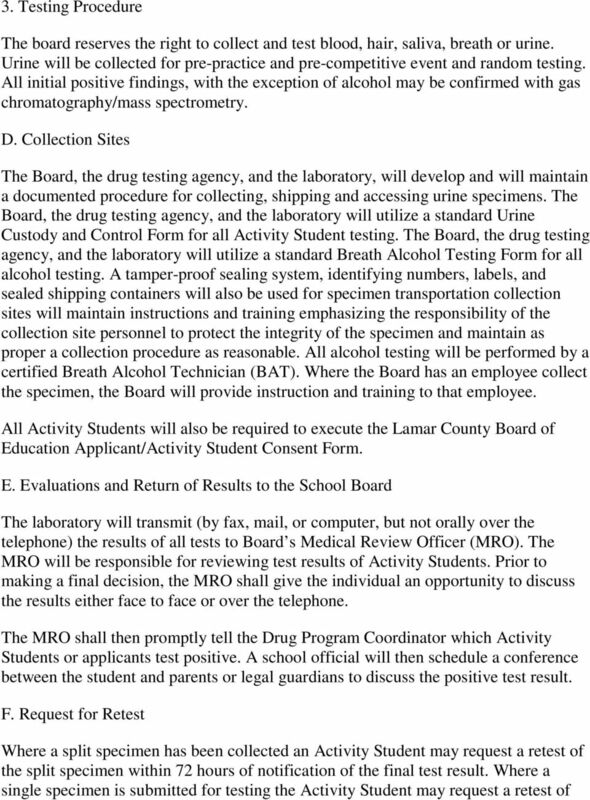 General guidelines The School Board and its lab shall rely, when practical, on the guidance of the federal Department of Transportation, Procedures for Transportation workplace Drug Testing Programs, 49 C.F.R. Pars 40.1 through and on the further guidance of the Onmibus Transportation Employee Testing Act provided in 49 C.F.R. Parts 382, 391, 392, and Substances Tested For All Activity Students Activity Students may regularly be tested for any controlled and/or illegal substances, including but not limited to: amphetamines, cannabinoids, cocaine, opiates, and alcohol. Activity Students may be tested for any other substances, (such as but not limited to steroids, barbiturates and benzodiazepines) without advance notice as part of test performed by the board for safety purposes. Such test will be coordinated with the Drug Program Coordinator. 5 the original sample within 72 hours after notification of the final test result. Request must be submitted to the MRO. The Activity Student will be required to pay the associated cost of retest in advance but will be reimbursed if the result of the retest is negative. G. Release of Test Results All information, interviews, reports, statements, memoranda, and test results, written, or otherwise, received by the Board through its drug and alcohol testing program are confidential communications and may not be used or received in evidence, obtained in discovery, or disclosed in any public or private proceedings except in accordance with the Policy Consent/Release Form. However, all Activity Students will be required to execute a consent/release form permitting the Board to release test results and related information to the school officials who have a need to know. Parents or guardians will be informed of confirmed positive test results by a Board designee. The MRO shall retain the individual test results for five (5) years. VII. Discipline The Board will discipline, including suspension from extracurricular activities, Activity Students for any violation of the policy, including refusing to submit to screening, to execute a release, or otherwise cooperate with and investigation or search by the administration. 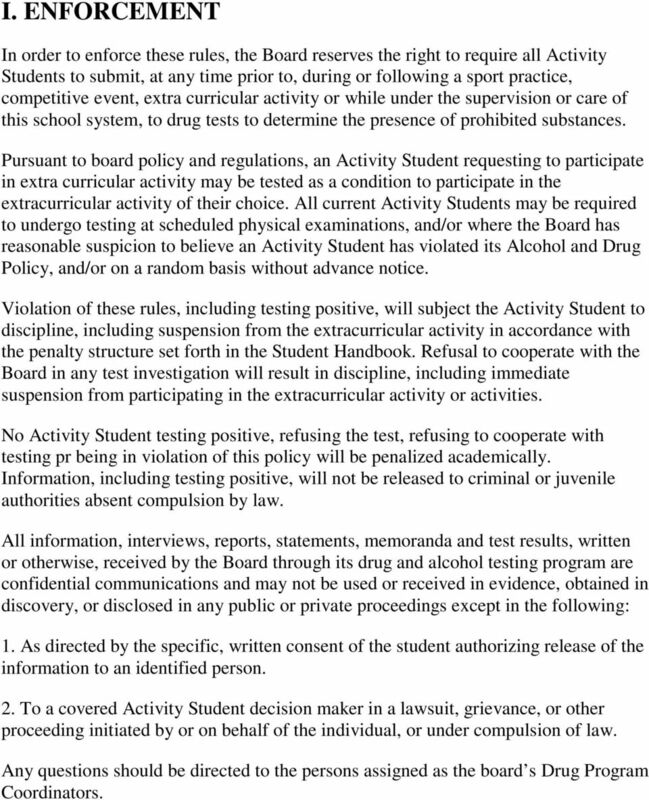 All Activity Students who test positive in a confirmative substance test will be subject to and including immediate suspension from all extracurricular activities. No Activity Student may be returned to regular Activity Student activities after any rehabilitation or testing positive unless certified as safe and no using drugs by having a negative result on a return-to-participation screen. 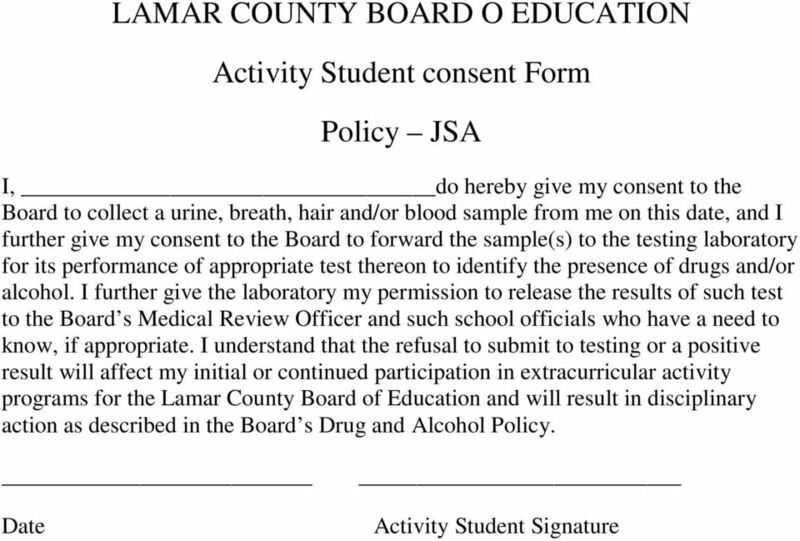 Any Activity Student returned to participation after violating the policy or testing positive will be subject to aftercare and random testing as set out in a written Probation Agreement which he or she will be required to execute. 6 VIII. Activity Student Assistance Program The Board s drug testing agency shall include education and training for coaches, assistant coaches, faculty sponsor and school officials who are authorized to determine reasonable suspicion testing. These adults must receive a minimum of 60 minutes on alcohol abuse and an additional 60 minutes of training on controlled substance use and abuse. The training shall cover the physical, behavioral, speech and performance indicators of probable use and misuse of alcohol and controlled substances. Documentation of training attendance must be maintained. The Drug Program Coordinator should be contacted for further guidance. IX. Investigation/Searches Where a school official has reasonable cause to suspect that an Activity Student has violated the substance abuse policy, he or she may inspect vehicles which an Activity Student brings on the Board s Property, lockers, purses, book bags, or other belongings, and at locations where school related activities are being conducted without prior notice in order to ensure extracurricular activities occur in an environment free of prohibited substances. An Activity Student may be asked to be present and remove a personal lock. Where the Activity Student is not present or refuses to remove a personal lock, a school official will do so for him or her. Detection of prohibited substances from authorized searches will be communicated to the Drug Program Coordinator. 8 DRUG TESTING OF ACTIVITY STUDENTS In an effort to protect students electing to participate in extra-curricular activities from controlled substance and illegal drug use and abuse, and to promote the health and safety of its students, the Lamar county Board of Education adopts the following policy for drug testing of Activity Students. The Lamar County Board of Education (The Board) recognizes Activity Students (as that term is later defined in this policy) as present and future assets to our sports and leadership education process. Activity Students, as role models for other students, are a key to our goal, and to maximize the skills and talents of our students, it is important that every student, as well as employees, of our school system understand the dangers of drug and alcohol abuse. Participation in school-sponsored interscholastic extra-curricular activities in the Lamar County Schools is a privilege. Students who participate in these activities are representing the school district and the community. Accordingly, students electing to participate in extra-curricular activities have a responsibility to themselves, their fellow students, their parents and their school to set the highest possible examples of conduct, sportsmanship, and training, which includes avoiding the use or possession of controlled substances and/or illegal drugs. "Activity student" means a member of any (9-12) Lamar County Schools sponsored extra-curricular organization which participates in interscholastic competition. This includes any student who represents Lamar County Schools in any extra-curricular activity in interscholastic competition, such as, but not limited to, Band, Cheerleaders, Majorettes, and Athletics. The Board reserves the right to depart from these policies and procedures where it deems it is appropriate. Except where specifically prohibited by law, the guidelines contained within this document may be changed by the Board at any time. Students covered by this policy and procedures will be informed of changes. This policy supplements and complements all other policies, rules, and regulations of the Lamar County Schools regarding possession or use of illegal drugs. 9 POLICY OBJECTIVES 1. To create and maintain safe, drug-free environment for all Activity Students. 2. To encourage any Activity Student with a dependence on, or addiction to, alcohol or other drugs to seek help in overcoming the problem. 3. To reduce the likelihood of incidents of accidental personal injury and/or damage to students or property. 4. To minimize the likelihood that school property will be used for illicit drug activities. 5. To protect the reputation of the school system and its students. Substance abuse can be a serious threat to the school system, its students, visitors and employees. While the percentage of substance abusing Activity Students may be relatively small in absolute terms, any substance abuse may significantly affect the health and safety of the abusing student or the student s classmates. Moreover practical experience and research indicate that appropriate precautions are necessary. It is the belief of the Board that the benefits derived from the objectives outweigh the potential inconvenience to Activity Students, and the board has established the policy in accordance with the decision of the United States Supreme Court on June 27, 2002 in the case of board of Education of Independent School District no. 91 of Pottawatomie County, et al v Earls, et al. the Board earnestly solicits the understanding and cooperation of all students and parents, especially those participating in extra curricular activities, in implementing this policy. 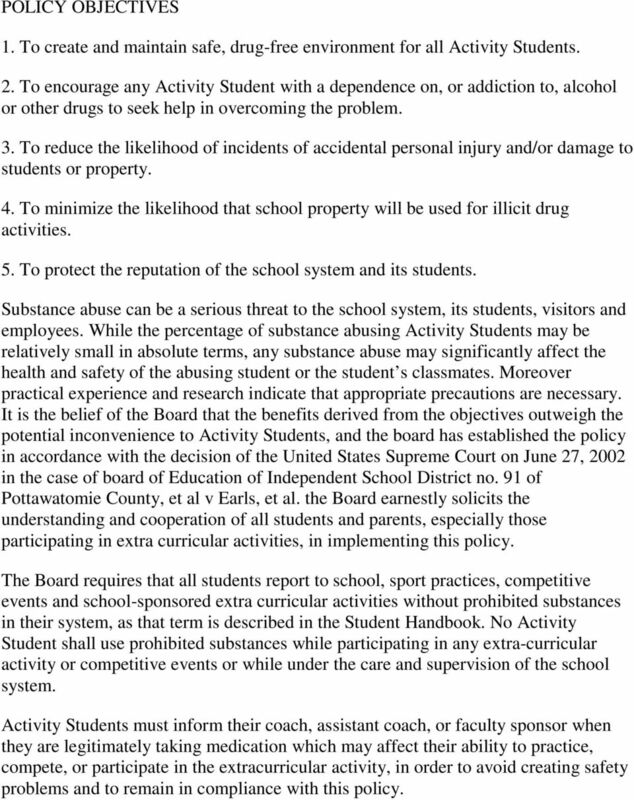 The Board requires that all students report to school, sport practices, competitive events and school-sponsored extra curricular activities without prohibited substances in their system, as that term is described in the Student Handbook. No Activity Student shall use prohibited substances while participating in any extra-curricular activity or competitive events or while under the care and supervision of the school system. Activity Students must inform their coach, assistant coach, or faculty sponsor when they are legitimately taking medication which may affect their ability to practice, compete, or participate in the extracurricular activity, in order to avoid creating safety problems and to remain in compliance with this policy. 10 I. 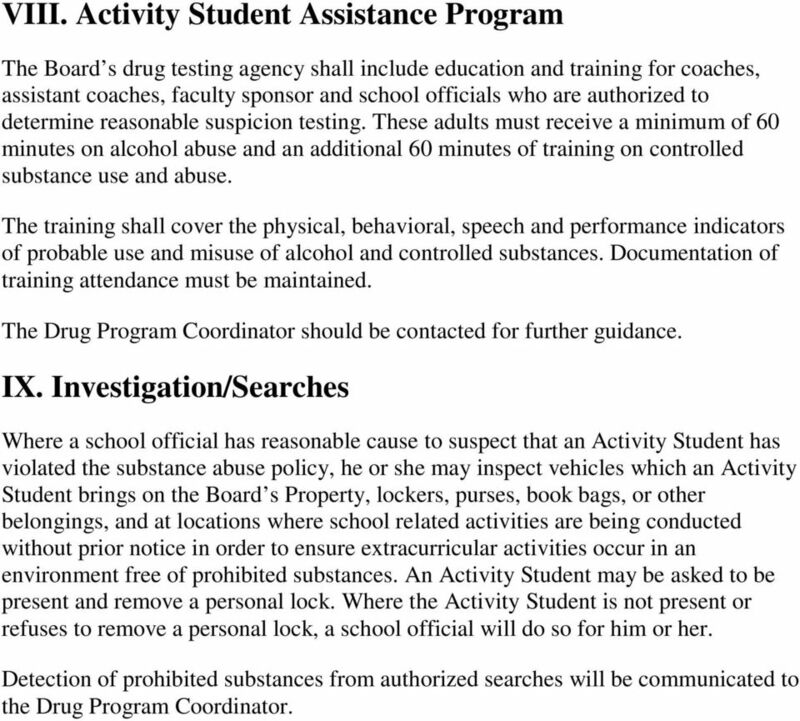 ENFORCEMENT In order to enforce these rules, the Board reserves the right to require all Activity Students to submit, at any time prior to, during or following a sport practice, competitive event, extra curricular activity or while under the supervision or care of this school system, to drug tests to determine the presence of prohibited substances. Pursuant to board policy and regulations, an Activity Student requesting to participate in extra curricular activity may be tested as a condition to participate in the extracurricular activity of their choice. All current Activity Students may be required to undergo testing at scheduled physical examinations, and/or where the Board has reasonable suspicion to believe an Activity Student has violated its Alcohol and Drug Policy, and/or on a random basis without advance notice. 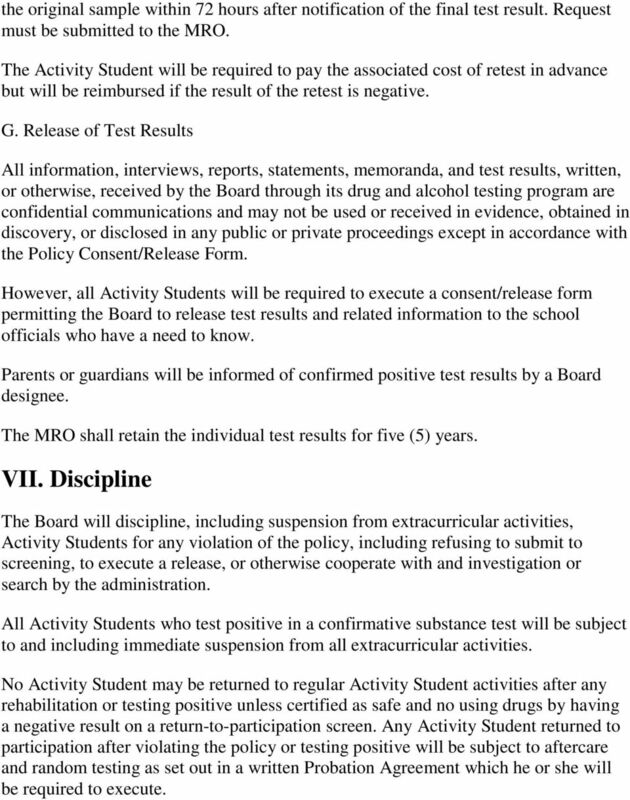 Violation of these rules, including testing positive, will subject the Activity Student to discipline, including suspension from the extracurricular activity in accordance with the penalty structure set forth in the Student Handbook. Refusal to cooperate with the Board in any test investigation will result in discipline, including immediate suspension from participating in the extracurricular activity or activities. No Activity Student testing positive, refusing the test, refusing to cooperate with testing pr being in violation of this policy will be penalized academically. Information, including testing positive, will not be released to criminal or juvenile authorities absent compulsion by law. All information, interviews, reports, statements, memoranda and test results, written or otherwise, received by the Board through its drug and alcohol testing program are confidential communications and may not be used or received in evidence, obtained in discovery, or disclosed in any public or private proceedings except in the following: 1. As directed by the specific, written consent of the student authorizing release of the information to an identified person. 2. To a covered Activity Student decision maker in a lawsuit, grievance, or other proceeding initiated by or on behalf of the individual, or under compulsion of law. Any questions should be directed to the persons assigned as the board s Drug Program Coordinators. 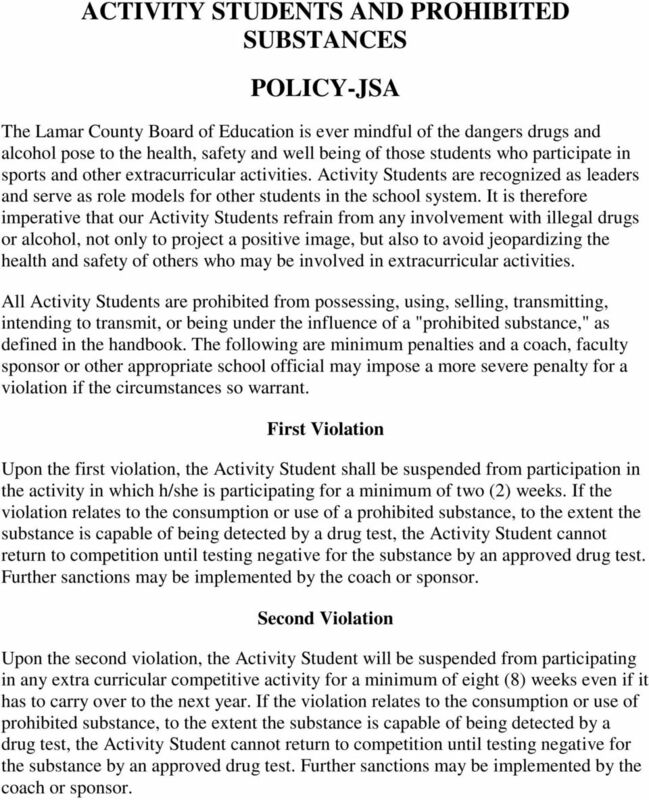 11 ACTIVITY STUDENTS AND PROHIBITED SUBSTANCES POLICY-JSA The Lamar County Board of Education is ever mindful of the dangers drugs and alcohol pose to the health, safety and well being of those students who participate in sports and other extracurricular activities. Activity Students are recognized as leaders and serve as role models for other students in the school system. It is therefore imperative that our Activity Students refrain from any involvement with illegal drugs or alcohol, not only to project a positive image, but also to avoid jeopardizing the health and safety of others who may be involved in extracurricular activities. 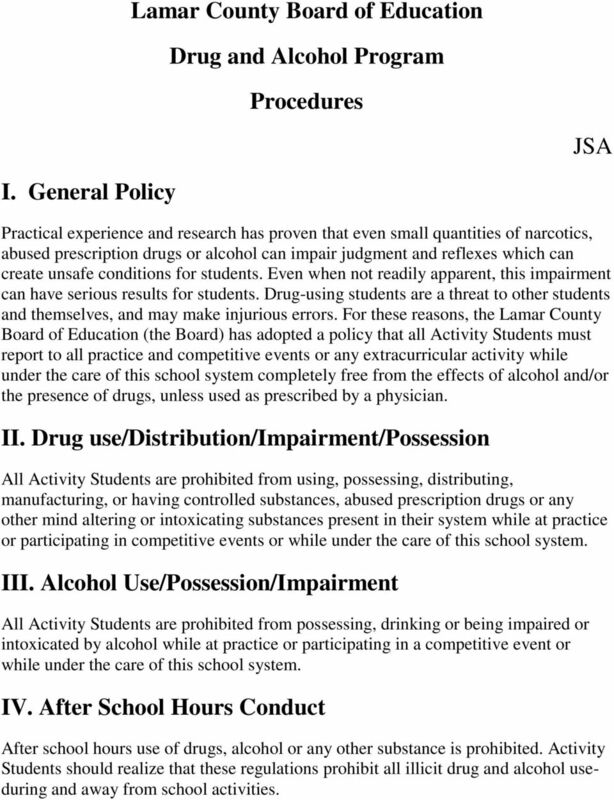 All Activity Students are prohibited from possessing, using, selling, transmitting, intending to transmit, or being under the influence of a "prohibited substance," as defined in the handbook. The following are minimum penalties and a coach, faculty sponsor or other appropriate school official may impose a more severe penalty for a violation if the circumstances so warrant. First Violation Upon the first violation, the Activity Student shall be suspended from participation in the activity in which h/she is participating for a minimum of two (2) weeks. If the violation relates to the consumption or use of a prohibited substance, to the extent the substance is capable of being detected by a drug test, the Activity Student cannot return to competition until testing negative for the substance by an approved drug test. Further sanctions may be implemented by the coach or sponsor. Second Violation Upon the second violation, the Activity Student will be suspended from participating in any extra curricular competitive activity for a minimum of eight (8) weeks even if it has to carry over to the next year. 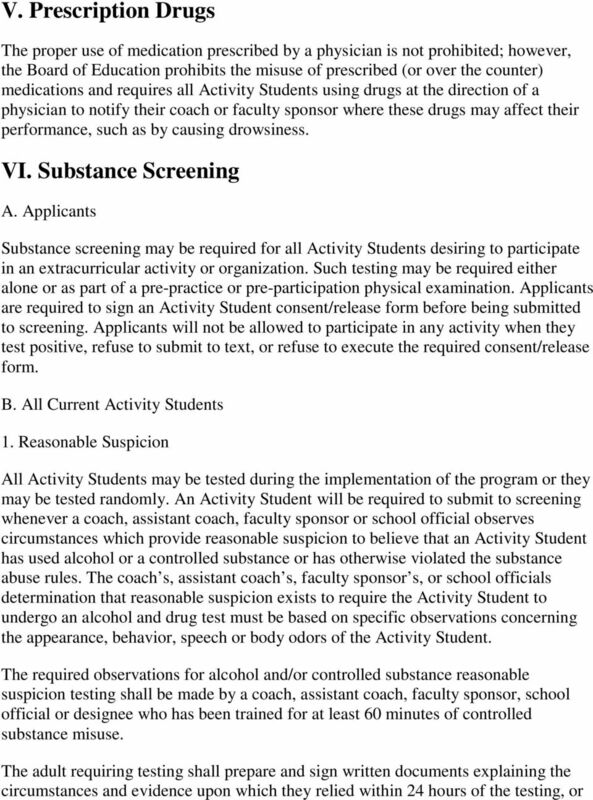 If the violation relates to the consumption or use of prohibited substance, to the extent the substance is capable of being detected by a drug test, the Activity Student cannot return to competition until testing negative for the substance by an approved drug test. Further sanctions may be implemented by the coach or sponsor. 12 Third Violation The third violation shall result in the suspension of the Activity Student for a period of one full calendar year from the activity. The student before being reinstated to participate will have to test negative for the substance and undergo counseling as prescribed by a professional. Further sanctions may be implemented by the coach or sponsor. 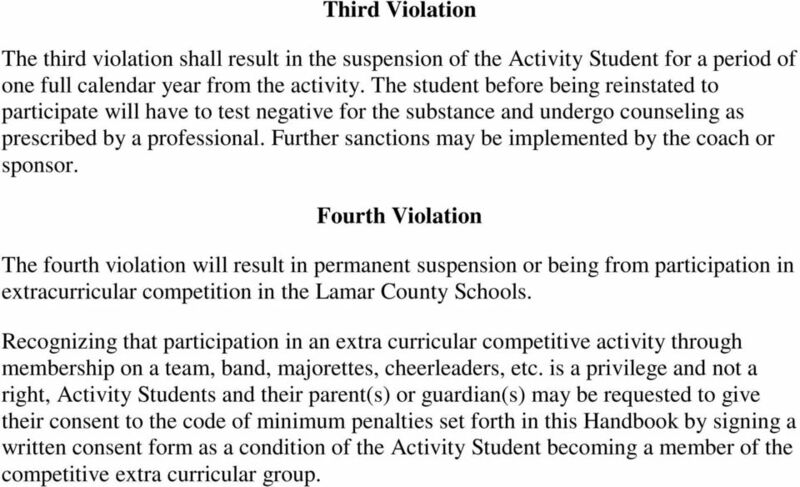 Fourth Violation The fourth violation will result in permanent suspension or being from participation in extracurricular competition in the Lamar County Schools. Recognizing that participation in an extra curricular competitive activity through membership on a team, band, majorettes, cheerleaders, etc. is a privilege and not a right, Activity Students and their parent(s) or guardian(s) may be requested to give their consent to the code of minimum penalties set forth in this Handbook by signing a written consent form as a condition of the Activity Student becoming a member of the competitive extra curricular group. DRUGS AND ALCOHOL. Substance screening may be required of any employee if there exists reasonable suspicion to support such request. DPA: A national certified Drug Program Administrator, which shall use a certified laboratory in testing of samples. Drug-Free Workplace I. Purpose PERSONNEL: Conduct To implement Board of Education of Baltimore County (Board) Policy 4101 by establishing guidelines for employees regarding the drug-free workplace policy. a. All new hires are required to complete a drug screening test. With the goal of a drug free environment, Nebraska has developed the following program.